Carolingian scholars, in order to feel closer to God, were interested in everything that would help them explain the world as he created it. They showed a great fascination for alphabets and their inventors, which led them to produce the first systematic (though still basic) studies of languages, including in many cases the vernacular. 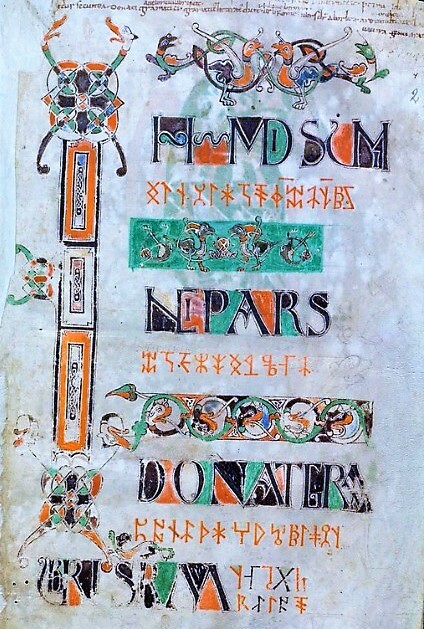 Carolingian scholarship often took the form of encyclopaedic compendia, and their linguistic studies therefore also frequently materialised as straightforward or occasionally extensive alphabet collections. However, since their society was dominated by a single script, the Roman alphabet, one cannot help but wonder where they sourced these other alphabet materials. The Carolingian era (eighth and ninth centuries) was in many ways crucial for the development of the Western world as we know it, but especially so for its intellectual history. 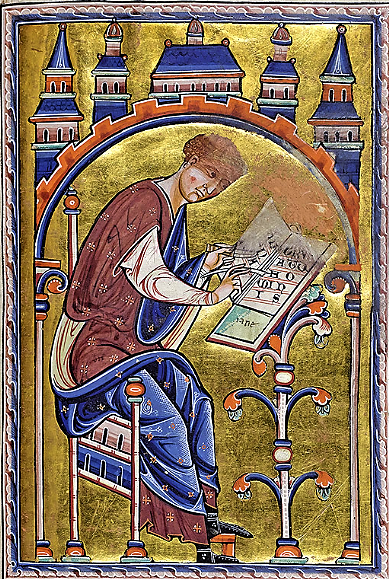 The Carolingian Renaissance (which began in the late eighth century) created a great increase in the exchange of knowledge and allowed scholars to dramatically expand their horizons. Carolingian scholars were interested in a wide range of topics, but their interests all essentially derived from the same idea: to understand the world was to understand God. Especially sciences such as computus became popular, as they allowed for the calculation of important dates to the Christian calendar. It has been argued that medieval science was rather limited as a consequence of this underlying motivation: if it did not serve religion, there reportedly was little interest in it. This seems a rather black-and-white view held by modern scholarship, however. When it came to the study of alphabets, for instance, the Carolingians were more than willing to overstep this line. Though the majority of the linguistic material does concern the linguae sacrae, or ‘the holy languages’ (by which is meant the three biblical languages, Hebrew, Greek, and Latin), alphabet collections or linguistic treatises from this time period quite quickly expanded to include materials from non-religious sources, i.e. the vernacular. Carolingians had a keen interest in how languages were representative of cultures and a particular affinity for scripts. The latter may be explained by the fact that a new script had been created, now known as the Caroline minuscule. The use of this uniform script across Carolingian scriptoria greatly facilitated the transfer of knowledge across the Empire. This created increased movement by scholars and educators and intensified the contacts with many different languages and cultures. It is then perhaps no wonder that the Carolingians have been credited with the first medieval linguistic scholarship of the vernacular, even in such a basic form as an alphabet collection. The Carolingian alphabets collections appear to be, above all, a point of scientific and/or cultural interest. The material appears often in conjunction with encyclopaedic and linguistic information or texts (i.e. next to texts discussing the weather, calculations of lunar cycles, and treatises on Latin grammar). That said, alphabets are also found on their own, tucked away in margins and in between pen-trials on fly-leaves. 1. The common letters of the alphabet are the primary elements of the art of grammar, and are used by scribes and accountants. The teaching of these letters is, as it were, the infancy of grammar […]. Indeed, letters are tokens of things, the signs of words, and they have so much force that the utterances of those who are absent speak to us without a voice […]. 4. The Latin and Greek letters seem to be derived from the Hebrew, for among the Hebrews the first letter is called ‘aleph’, and then ‘alpha’ was derived from it by the Greeks due to its similar pronunciation, whence A among Latin speakers; […] hence we can know that the Hebrew language is the mother of all languages and letters. Isidore’s influence can be seen in the frequent inclusion of alphabets and alphabet collections in treatises or sections on grammar. His framework of presenting the material in a Roman alphabet sequence and providing letter-names was also taken as a clear instruction, as most alphabet collections and linguistic treatises provide this, occasionally also including a short section with information on the language associated with the alphabet. Perhaps this is also where the interest in the vernacular came from: Isidore was invested in deriving all alphabets from Hebrew and giving languages a biblical origin. Later in his work he applies this idea to languages such as Egyptian or Scythian, which he derives from Hebrew via Greek; it is not hard to picture how his method would have encouraged later scholars to try this with other (or their own) alphabets. Although Isidore may have be one of the catalysts for the phenomenon of alphabet collecting, the Carolingians clearly did not need much encouragement. Though perhaps initially an academic interest, it sparked a whole tradition of alphabet collections which were used not only for serious linguistic works, but also for colophons, decorative capitals and secret messages. Interestingly, this more playful way of including foreign alphabets into texts can already be found in manuscripts from before the Carolingian period, and especially so in manuscripts written by scribes who were trained in Irish monasteries. The aim of my research project is to examine if these early Irish manuscripts which show a playful interest in alphabets are in any way related to the Carolingian alphabet collections. In the first instance, my project will collect the various manuscripts containing alphabets (with a special interest in those which contain vernacular alphabets) and analyse them as a group. The purpose of this first study is to investigate the types of alphabet material, the linguistic knowledge present in the manuscript (by looking at explanatory texts, correct (or incorrect) transliteration, and shapes of the characters) and the context in which the manuscript was made (provenance of manuscript and scribe, dating, etc. ), to allow for drawing a number of general conclusions. 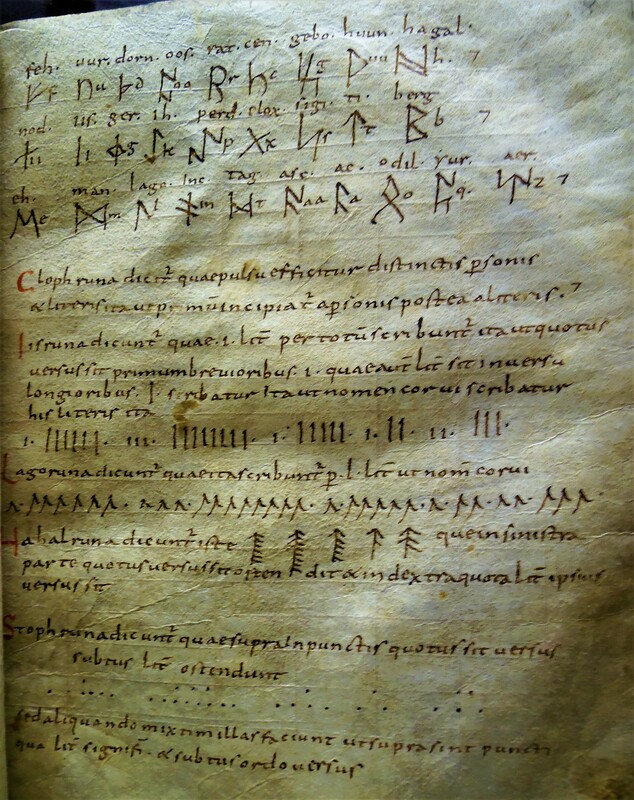 This overview of manuscript contents could lift the veil on some of the linguistic knowledge of that time and tell us which elements were interesting to whom and at what time: for instance, if the majority of early Carolingian French manuscripts contain single runic alphabets in the margins, that demonstrates that there was an interest in this material in the eighth century, but also that this was an interest which was unlikely to be mainstream and or of great importance. In the second instance, I will compare the type of material and knowledge present in these Carolingian manuscripts with earlier manuscripts (from the seventh and early eighth century) written by Irish or insular scribes. Early medieval Irish scholars showed a great interest in foreign alphabets, potentially due to their own bilingual society at the time (and to some extent still today). Many of these scholars would also have been part of the conversion movement and therefore travelled quite frequently across the Carolingian Empire. For this reason, it is worth investigating whether they might have had any influence on the Carolingian language scholarship. Comparing insular and Carolingian manuscript data can help determine whether the concept of collecting and studying alphabets was originally a Carolingian invention, or if the Carolingians had some help from their colleagues across the sea. © Aya Van Renterghem and Leiden Medievalists Blog, 2019. Unauthorised use and/or duplication of this material without express and written permission from this site’s author and/or owner is strictly prohibited. Excerpts and links may be used, provided that full and clear credit is given to Aya Van Renterghem and Leiden Medievalists Blog with appropriate and specific direction to the original content.